I got my first beauty box today! In a few months, I'll also be comparing the "beauty box" with the "lust have it" subscription. So stay tuned to find out which subscription I think is the better choice and why.. I LOVE shu cleansing oil! I think I will have to subscribe, looks good. Hehe I just blogged about the exact same thing. It is so much fun to get this once a month. The cleanser is amazing. It looks like they give you good size samples! I might have to subscribe because these products are awesome! Very nice. I've never tried one of those. And thank you for the comment. My lipstick was Fifth Avenue Fuchsia by Maybelline. I have never heard of this before!! 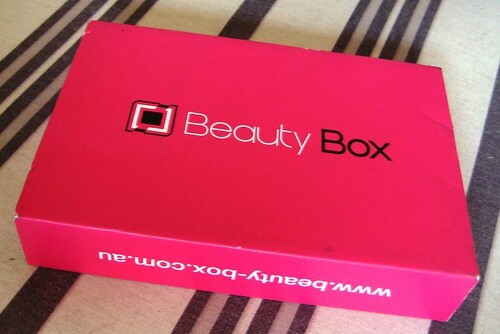 Beauty Box? I will have to google it to get more info!!! Love all the products! Can't wait to see your reviews! This is just too cute! I'd never seen this before and I'd definitely would love some of those goodies, lol! PS: wanted to invite you to join my Turban Headband Giveaway! Looks amazing!! I have never heard of it before!! Can't wait to tell us which product was your favorite!! What a great little package! awesome! Love getting fun packages like this!